Nilwood (population 284) is located in southwestern Illinois in the northeastern portion of Macoupin County. Nilwood sits about 25 miles south (and a little west) of Springfield. Illinois Route 4 is the main roadway to and from Nilwood. County Highway 28 also leads to Nilwood. The Southern Pacific Railroad line passes through the heart of town. Nilwood was incorporated in 1867. The population at that time was about 700. The town was named by the railroad engineers who first traveled through the area. There were very few trees from which to gain needed wood for the steam engine boiler, so the saying "nil wood" meant "no wood". The name eventually stuck. Like many small towns of the late 1800s, prosperity lasted through the early 1930s. A population of about 500 was enjoyed then. Since that time most businesses and residents have left, leaving the town holding steady at its current population. "In the early part of the twentieth century, Nilwood had the coal mine, bank, post office, 3 or 4 general/grocery stores, tavern, grain elevator, blacksmith shop (maybe two blacksmith shops), a high school and grade school, and, when gasoline cars came along, Nilwood boasted more than five filling (gasoline) stations." "I had done my student teaching at Nilwood during the 1974-75 school year and was hired as a teacher for the 1975-76 year. 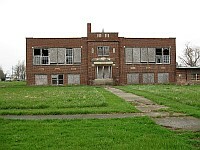 Nilwood Elementary housed only first and second grades at that time, with grades K and 3-12 attending school in Girard. Mr. David Goddard was Principal, although his office was in the Girard grade school. I have no knowledge of when the Nilwood building ceased serving as a school, as I moved from the area in 1976. During April 2013, I stopped by the old Nilwood School, to find that it had recently been razed, most likely sometime in 2012 or earlier in 2013. All that remained were a couple of piles of bricks, which I was later informed were apparently left for anyone who wanted a memento." Our guess is that Nilwood High School existed through at least the mid 1940s. The school was consolidated into the Girard School District. The kids of Nilwood today attend North Mac High School in Virden. Nilwood High School probably competed in boys basketball and track. They may have also competed in baseball. If you have any other information you can provide regarding the history of the Nilwood High School athletic program please forward it to us so we may share it on this page. Did Nilwood High School have a band? Chorus? FFA? FHA? It is likely that the Nilwood kids had many opportunities to participate in these and other activities at the school. Thank you to our long time contributor and great fan Roberta VanBriesen for finding the information that led to the creation of this page. May the memories of Nilwood High School live on forever!